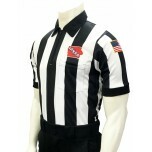 High school football referees in Iowa can wear 2 1/4" stripes with the IHSAA logo centered above the pocket and a USA Flag on the left sleeve. Great shirt. Much cooler than old polyester football referee shirts. Sublimated patches much nicer. Don't have to worry about them curling up or loose stitching. Highly recommend. This is the first year where the state office has allowed the IHSAA patch to be sublimated by major manufacturers. This is a welcomed change as there is no longer any sewing required for our high school football shirts. Both are printed in fine detail on a standard Smitty offering. My crew will be wearing these for the foreseeable future. 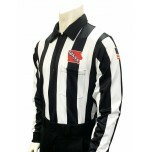 Here's to hoping we do not need to buy any more referee shirts for a long time!